a Chigo parade last Saturday. The parade is a commemoration for rebuilding one of their buildings. when they construct or rebuild their building. The Chigo parade was led by 600 kids and the Shinto priest and horse. The shrine is famous for religious services with horses. 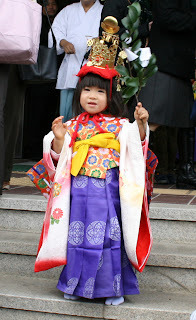 Then, my daughter joined the Chigo parade. They rented us kimonos and a hair ornaments. There is the custom in Aichi and the nearby areas. the girls will be happy for life. My daughter has done this once. I never joined the parade, when I was boy. It may be OK, because I am boy! My wife has done this once. It is Ok, better than nothing.